TV show dates: February 27, 2018 — present. Performers include: Josh Duhamel, Jimmi Simpson, Marcc Rose, Wavvy Jonez, Dominic L. Santana, Scott Michael Campbell, Michael Harney, Jamie McShane, Camille Chen, Laurie Fortier, Spencer Garrett, Skylan Brooks, Aisha Hinds, Luke James, and Angel Manuel. The Unsolved TV show is a true-crime anthology series. The first season is entitled, Unsolved: The Murders of Tupac and The Notorious BIG. It is based upon the Greg Kading book, Murder Rap: The Untold Story of the Biggie Smalls & Tupac Shakur Murder Investigations by the Detective Who Solved Both Cases. 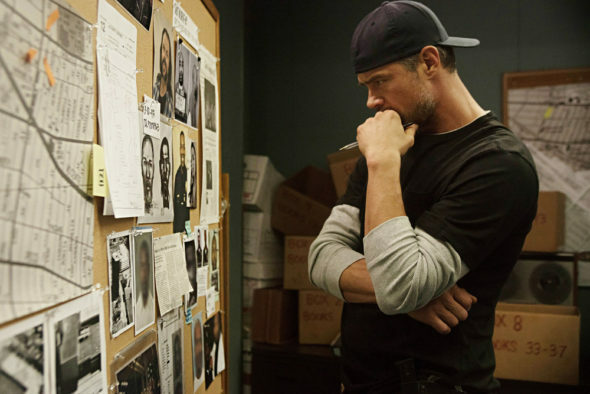 Season one delves into the police investigations by Detective Kading (Duhamel) and Detective Russell Poole (Simpson) into the controversial murders of rappers Tupac Shakur (Rose) and Christopher Wallace, a.k.a. The Notorious B.I.G. (Jonez). The series examines the complex relationship between the two stars, as well how their deaths affected hip hop culture. What do you think? Do you like the Unsolved TV series? Should this USA Network TV show be cancelled or renewed for another season? More about: Unsolved, Unsolved: canceled or renewed?, Unsolved: ratings, USA Network TV shows: canceled or renewed?